I'm always amazed by seeds, as I'm sure many of you are. all that potential saved up in that little package. 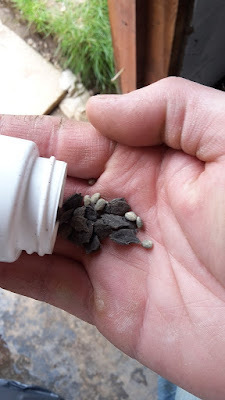 Last year I saved some Fat Baby Achocha seeds (a type of exploding cucumbers), although they weren't an incredible veg they were still interesting and tasty enough to be worth growing again at some point. I saved the seed in an old medicine bottle once I'd dried them and just to make sure I added some rice to absorb any moisture left in them. I obviously got it wrong somewhere down the line and when I came to use them a few weeks ago they were mouldy, you could smell the mould on them before you could see it. 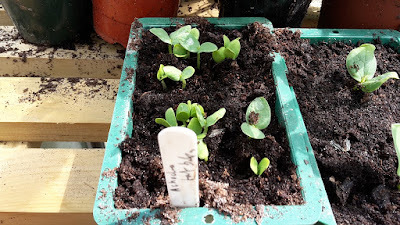 I really didn't fancy spending out again on these seeds so I thought I'd just sow them anyway, mould and all, and see what happened. I sowed them thickly, left them a week or so in the greenhouse and ended up with a pretty much 100% germination rate! I really didn't think they would germinate, so I'm pretty pleased. A ripe fruit from last summer. 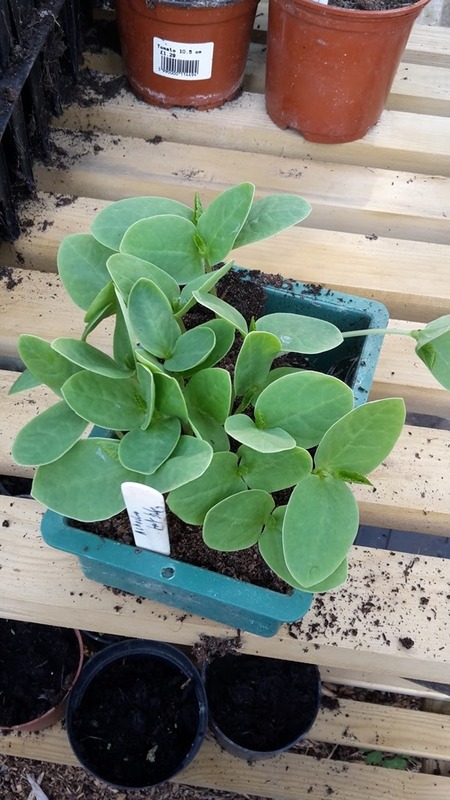 I'll make sure I'll grow a few plants this year from my seedlings and I'll save a new batch of seeds, picking out the best fruit to save from. This time I'll make sure they're 100% dry before I store them. How does everyone else dry their seeds for seed Saving? Is there a way that you can check how dry they are before storing them? I do the same; I thought everyone did! I pop mine into a clean coffee filter, I hook it up and leave it for ages, I keep loads of cheap coffee filters in my shed. We have a local shop called Tiger and I buy 100 for a pound. It also is good for popping seed heads in, once they dry and open I can get all the seeds. Wow isn't nature amazing!!! That's great. I have hope yet! Kev - we practice a very technical form for drying seeds. first, we let them dry on the stalk of the actual veg. now get a pen and paper, you'll need to write this down. once the seeds are drying/dried on their veg, we put paper bags over the seed head and shake the seeds into the bag. if they are tiny seeds we use a linen cloth and line an old window screen. we put the lined screen on our deck, lay the seeds out on the linen and put another old screen on top with rocks in the corners to hold the screen down. then we leave the screens in the sun and let them dry in the sun all day. if they aren't completely dry on the first day, we take the screens in the house overnight and put them out the next day. with bigger seeds we don't need to line the bottom screen. and the sun does all of the work for us - bahahahh! see pretty technical eh? once any seed is dried we put them in paper bags with some rice and store them in our atticy/pantry/food storage area that is coolish and dark. i never put seeds in plastic - just a thing with me. congrats on your mouldy seeds - i have to admit i have never heard of anyone growing mouldy seeds but your plants look fine to me! I am amazed those mouldy seeds not only sprouted but have grown into healthy looking plants! I think I would suggest not closing saved seeds up in the plastic bottles. But even mouldy, the container worked for you! I've been buying plants already growing in little pots. You just take the plastic part off and plant the vegetables, pot and all. I'm diabetic and my test strips come in this little hard plastic bottle. I guess you call it a bottle. It has a lift top so I don't know if that would be enough to protect seeds that were being saved. I often toss them in a pile to save but I've never figured out a use for them. Maybe I could see if anyone of my Freecycle could use them for seeds - or for anything else. Hate to waste them. I dry mine on a piece of paper towel on top of the lid of the Aga for a few hours then in a dry cooler place for a few days. Once totally dry I store them in little paper wage envelopes ... sometimes I even remember to write on the packet what is inside.